Any additions? Please let me know. 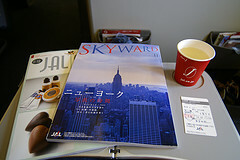 I collect the different airline seat-back magazines on my international trip. They are free and a great way of learning more about other cultures. Great idea. If you grab the magazine, the slippers, and the sleep mask, you could have a whole inflight kit. You are currently reading Inflight Magazines: My Virtual Seat-Back Pocket Runneth Over at Clearing Customs.